As market leaders our customers benefit from our established supply chain to added value customers throughout Europe. This means that we are able to offer a consistently high and stable price for conventional brown Linseed, yellow Linseed and organic Linseed but with the added security of no yield risk to the producer. With over 25 years of specialist knowledge and experience of the Linseed crop, our dedicated team provides a full and professional service to the Linseed grower. No fixed yield requirement and minimal quality criteria - ALL contracts are for the "produce of the area"
EasyCut varieties again proved a hit with growers with comments like "it was a dream to cut" or "we absolutely flew through the crop" being common-place. Their combination of short straw and low fibre content maximises harvestability and minimises combine down-time. Premium Crops are the UK’s largest producer of Brown, Yellow and Organic linseed and as such have a strong interest in getting the best from the UK acreage. As part of an ongoing investment to improve the agronomy of the crop Premium Crops commissioned a range of sowing rate trials starting harvest 2014 which demonstrated that historical trends towards lower sowing rates (around 650 seeds/m2) has been deleterious to the yields that can be achieved. As a result of these trials, Premium Crops are supplying all of their Contracts with sufficient seed to sow at the 800 seeds/m2 sowing rate and have subsidised the seed costs such that growers should see little or no change in the seed price. There is a burgeoning market for organic linseed, both for human consumption and the animal feed industry. 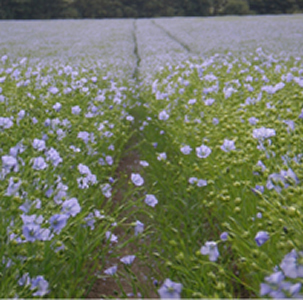 Premium Crops is looking for contract growers of Organic linseed.